Kohlschreiber playing the best I’ve seen him play. Nole will win 3rd set 6-2. Kohlschreiber looking good, will get breadsticked in the third. When does that ever last? This is proof Kyrgios didn't tank. Kohlschreiber just outplayed him. Wow Kohli 3 games away. Interesting. 2 games away for Kohli. Novak isn't at top form right now. I still think he can tough this one out, but the chances are decreasing every game. So are we still predicting 25+ grand slams and the CYGS this year for Djokovic or? And to think that the young talent is only gearing up towards his peak. Love him or hate him, he will fight back. That is what all champions do. Broke Kohli. Now Kohli will have to serve it out. Some may be taping the match to watch later...you are providing too much detail...not for me though...I’m watching live. Still the favorite for USO and strong contender for Wimby. A loss in M1000 doesn't change that. You can tell a potential match with karlovic was playing heavily on his mind. The mental block is still there without a doubt. 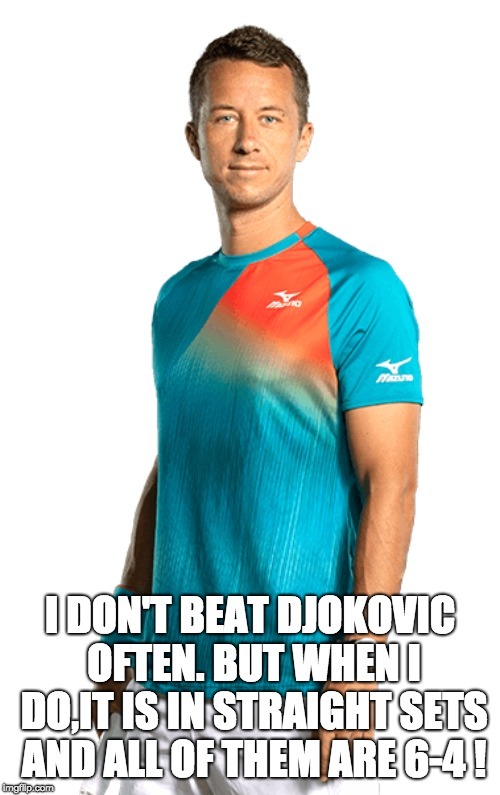 Yes, Novak performs better in slams when he doesn't win all other events in between. Yea something was way off today, time to improve and be more "ready" for the next tournaments. What matters is that he is ready for the upcomming 3 Grand Slams. Maybe he is betting on the matches. Buddies were in trouble with the bookies back home. No biggie, got a chance to catch a Clippers game before heading home. Better get the warning now than at an early slam round. Well done Kohl! Great win. Ancient bum from the trash weak era wipes out King Djoko? Reminds me of Federer's loss to Haas. He seemed to lack the usual intensity. Holy, you're right. Well spotted.